Our main communication tool at Mozilla is IRC. I’m running an IRC client called Irssi under screen on a server constantly connected to the network. It’s a close-to-perfect solution with only two outstanding issues for me. One is the lack of emoji characters (I can live with that). The other is more important: there is no easy way to install a solution to receive notifications. This gave us the idea for a small project — to build a generic server for sending notifications that could work alongside the Irssi client. Mercurius is a generic push server that lets developers bring Web Push into their own native/web applications. Subscription management is entirely handled by Mercurius; the user registers on the Mercurius website and receives a token that other applications can use to send customized push notifications via a REST API. Mercurius uses the web-push Node.js library to handle communication with the push service and takes care of the necessary payload encryption. A Mercurius client (in this case it’s an Irssi plugin), which uses a token (given to the user by the Mercurius server) to send the user push notifications via the Mercurius server. Once we have the subscription (comprised of an endpoint URL on the push service and a user’s public key), we can send its info to the server, which will then use it to send the user a notification. The user’s subscription to the push service is periodically refreshed, or, in some cases invalidated (see the Push Quota recipe in the ServiceWorker Cookbook for an in-depth look), so we need to always keep the server up to date with the user subscription information. This way, when the subscription changes, we notify the server of the new endpoint URL and the new key. Once our user is subscribed to the push service and to the Mercurial server, we can send push messages and show visual notifications. The Irssi plugin will send a POST request to the Mercurius server, asking it to send the notification to the user. The Mercurius server sends the notification to the push service, which then delivers the notification to the browser. The payload of the push notification is sent to the endpoint URL with some clever crypto. It provides the actual parameters for displaying the notification. (You can read more here about the encryption: https://tools.ietf.org/html/draft-thomson-webpush-encryption-01). The push notification triggers a ‘push‘ event in the service worker registered for the page, re-launching the service worker if it it is no longer active. As we mentioned earlier, we’re using the payload of the push message (for reference, see the Push Payload recipe in Mozilla’s Service Worker Cookbook) to pass the parameters of the notification from the Irssi plugin (or any other Mercurius client) to the service worker. We have implemented a few BDD tests with the Mocha framework to verify that the Mercurius server works correctly. We’ve also employed istanbul to measure code coverage and guide our test writing activity. Simply run npm test to see its output. We use skip_cleanup because we want to publish our build artifacts to Heroku. For more information about integrating Heroku deployment in Travis CI, see https://docs.travis-ci.com/user/deployment/heroku/. 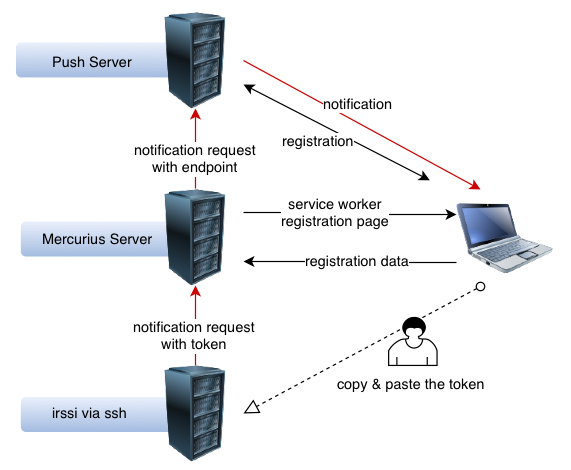 The role of the Irssi Mercurius client is to send a notification to the Mercurius server every time the user is mentioned. I've modified an existing script, which saves this info to a file, so that it now saves and sends the request to the Mercurius server. After loading the script, a new command is registered in Irssi. It's called /mercurius, and it sets the token, host (if you decide to run your own), and intensity of the notifications. There is also a method to stop and start again notifications at will. The plugin is written in Perl. Sending requests to the Mercurius server happens in the sub notify using the built-in HTTP::Tiny module. I've used the request method instead of post for backwards compatibility with older Perl versions. The subroutine responsible for sending the notification request is called notify. Description is given here inside the comments. The plugin is placed on GitHub along with install instructions. Use it to set the token. You will receive a notification confirming that it has been set. Default value is "https://mozcurius.herokuapp.com". Please note that the trailing slash has been removed. Switches on/off intense mode (default 0). With intense mode (1) all of the notifications are sent. Otherwise (default) if the user is in an active private window only the first message from that window will send a notification. /mercurius stop and /mercurius start are self explanatory. Wow nice hack 🙂 I’ll take some time to put it in production for myself.